Flowers for new baby arrangements are often softer in color and shape. Pastels are often chosen, as well as gender specific colored blooms. These can create memorable and touching bouquets for moms to enjoy. One of the first tips for boys is to go with traditional colors. Shades of blue is the traditional color for any type of flower. Pastel blues may also be used for a more subtle floral arrangement. White flower blooms may also be used to create the arrangement. These white blooms often include daisies, roses and chrysanthemums. Lilies, carnations or other festive flower blossoms can be used. Soft blue accessory pieces may also be added to the arrangement. A simple ribbon can be tied around the neck of the vase if desired. This may be a solid color or feature polka dots or other shapes. 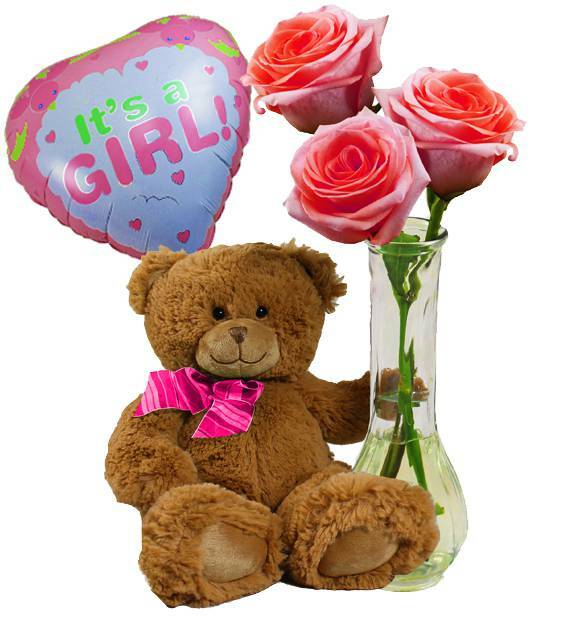 A fun boy’s toy or stuffed animal can be added to the floral bouquet. Soft stuffed toys can also be given to the child as he gets older. This adds an extra touch when sending floral arrangements to friends. Pink flowers for new baby girls are the most popular for parents. There are a number of bright pink blooms to choose from for bouquets. Daisies, roses, lilies and carnations are all top pink choices. White blooms may also be added to enhance the bouquet’s appearance. Baby’s breath or other filler may be added to create a soft display. These can make displays appear fuller and give them more shape. Pink and white mixtures are popular for those with girls on the way. These are often paired with a polka dot ribbon or satin ribbons. Brighter pink blossoms may also be mixed in with the softer colors. A fun vase may also be chosen to use for the arrangement display. These may include a coffee mug, a small bowl or a wide container. A shaped container, such as a duck or animal, may also be chosen. Colored baby blocks are another top choice for newborn floral gifts. Colored or painted decorative vases may also be chosen if desired. The shapes can create a whimsical appearance enjoyed by many parents. Those expecting know that an exact date may not always be possible. Because of this, many choose to send a floral gift before the birth. These gifts are often send the week that the newborn is expected. Some may prefer to wait until the mother has gone into labor first. When news comes that labor has started, an arrangement is sent. To send a bouquet the same day, floral delivery services are needed. A wide assortment of same day bouquets are listed on the floral site. This allows clients to see what can be delivered on the same day. These bouquets can then be delivered to nearly any hospital that day. Another option is to wait until the parents return home with the baby. These may be ordered days in advance or the same day if necessary. These flowers for new baby can be quickly delivered to their home.